The name Teriyaki refers to a process of cooking meat or fish by first marinading it in a thickish savoury/sweet glaze, and then cooking it under a grill or broiler. It's very quick, easy, and delicious. You can, of course, buy ready-made teriyaki sauce so skip this step if you are using that. Mix all ingredients together in a small saucepan on medium-low heat. Bring to the boil, then reduce the heat and simmer until the sauce has reduced by half. You need the sauce to be cool before you use it, so make it ahead of time and cool it in the fridge, or if you forgot to do it, stick it in the freezer. Place the salmon fillets in a food-grade plastic bag (you might want to cut the fillets into chunky slices if they are large). Pour in the marinade and massage it until the salmon is coated all over. Place in the fridge for about 30 minutes. Preheat your grill or broiler (I'm talking about the heating element that you usually find in the top of an electric oven). Place the salmon fillets on a foil-lined baking sheet and cook for about 6 minutes each side - maybe a bit longer if your fillets are thick. If you have any marinade left over, heat it up and pour it over the salmon. Don't use it cold - it's had raw fish in it. Sprinkle with sliced spring onion and sesame seeds and serve with rice or noodles. The video above is from the Keef Cooks YouTube channel. 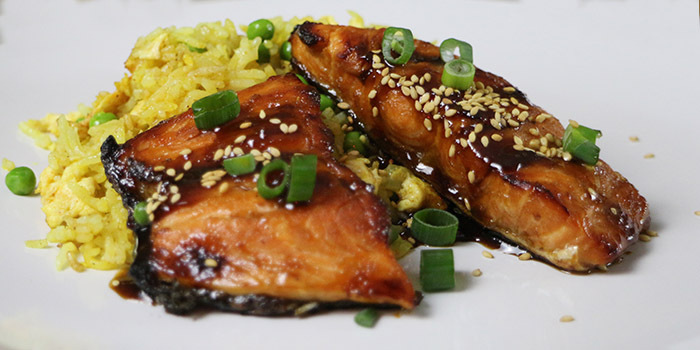 Click here to see the video recipe of Salmon Teriyaki on YouTube. Prep time: 10 minutes. Marinading time: 30 minutes.